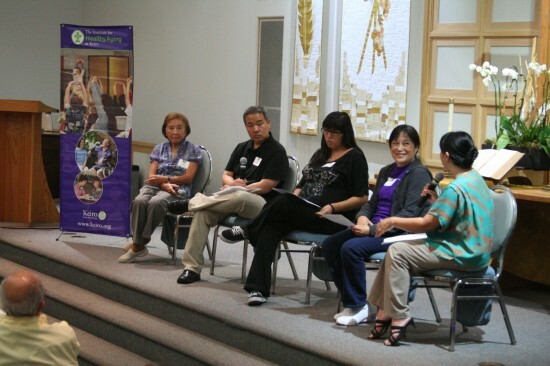 Keiro’s Genki Conference: Caregiver’s Edition was held at Faith United Methodist Church on April 27. 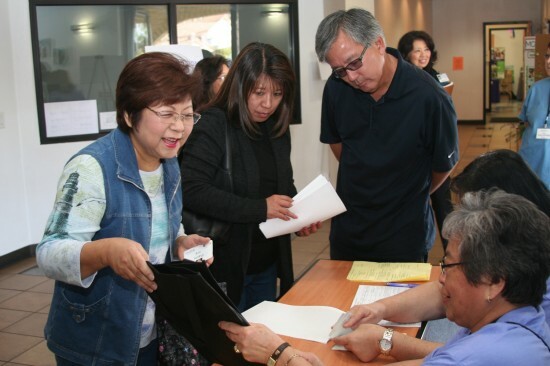 TORRANCE — According to the UCLA California Health Interview Survey, 25.3% of Japanese American adults 50 years and older who live in Los Angeles and Orange counties are caregivers. This staggering statistic was evident on April 27 at the Genki Conference: Caregiver’s Edition, presented by The Institute for Healthy Aging (a division of Keiro Senior HealthCare) and Faith United Methodist Church. Close to 160 people attended this free conference, held at the church in Torrance. The first keynote speaker, Donna Benton, Ph. D., spoke on “Navigating the Rough Waters of Caregiving.” A long-time supporter of Keiro, she is the director of the Family Caregiver Support Program, and a research assistant professor of gerontology at the USC Davis School of Gerontology. Benton shared that caregivers report that their own health has worsened since becoming a caregiver, that almost half of caregivers are clinically depressed, and that 80% of working caregivers report emotional strain. She then reviewed the array of community-based and facility options available. The next speaker was David S. Williams III, co-founder of InvolveCare, a free mobile health application that helps caregivers involve family and friends in caregiving activities. He was a caregiver for his mother and father, and with his wife, currently parents two children, one of whom is a special-needs child. His session on “Social Caregiving” was based on his 10-year experience caring for his mother, and his realization that while caregiving for an aging relative is a one-on-one experience between a senior and a caregiver, this relationship, while based on the love and respect between the two, often has inherent conflict as the senior grapples with the aging process and the caregiver moves into more of a “parental” role with an elder. He realized the need for organizing appointments and communication among family members in order to involve others in caregiving for a loved one. “The audience questions were great as they wanted to learn how to deal with tough family dynamics and what kind of caregiving platforms were out there,” said Williams. “I’ve heard many positive comments and from the filled sanctuary, it was evident that the community really valued the resources and information presented,” said Brian Fujimori, a panelist for a session titled “How I Discovered My Strengths Through Caregiving.” He is a caregiver for his 90-year-old father, who lives in a board-and-care facility, and the father of a 10-year-old son who tries to balance family life every day. Other panelists included Patricia Kobayashi and her daughter, Kyoko Vo, who are caring for Kobayashi’s mother, who lives in a board-and-care facility; and Mary Tamura, who has been caring for her spouse, Robert, at home for about 15 years. The panel was facilitated by Rie Honda Mizuki, Ph. D., a licensed psychologist and an outreach coordinator with the Asian American Christian Counseling Service since 1993. The presentations were followed by a Resource Fair featuring over 20 agencies and vendors, free health screenings provided by HealthCare Partners and SCAN Health Plan, free obento lunch sponsored by Aetna, pro bono legal consultations by Steven I. Awakuni, Esq., and Kazuaki Uemura, Esq., and pharmacy consultations by Patsy Matsushita, PharmD. The Genki Conference was made possible by Kaiser Permanente and the Keiro Senior HealthCare Endowment Fund with partial funding from the Takayama Foundation. For five years, she was the primary caregiver for her mother, who had Alzheimer’s, and in the midst of “squeezing out urine from carpets and bedding, scrubbing bathroom tiles at 3 a.m., staying up nights, answering constant calls,” her only solace was writing in her journal. She went on to establish the poetry and journaling support group for the Alzheimer’s Association-Aloha Chapter. “Mosaic Moon” is a collection of inspirational poetry, created from poetry workshops conducted by the Alzheimer’s Association Aloha Chapter. The free conference will feature the following breakout sessions: Poetry Writing Workshop, Hands-On Caregiving Demonstration, “Legal Tools and Tips for Caregivers,” and “Emotional and Spiritual Care at the End of Life.” A Resource Fair and professional consultations will also be included. To register, visit www.keiro.org/genki-conference-gvbc or call (323) 980-2353. 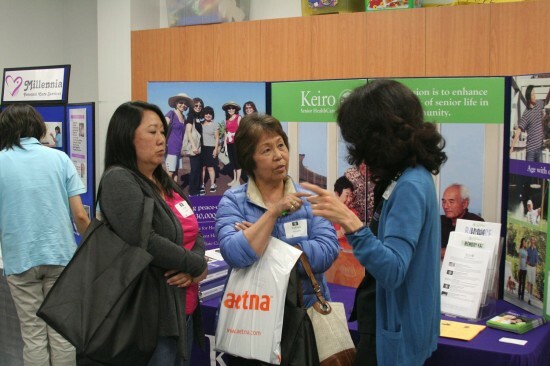 Caregivers and potential caregivers found helpful information during the Resource Fair.